Let us get something very clear at the start of our discussion on the personal interview round. PI is difficult. Very difficult. This is the first and the last time the college gets to interact with you before they take a call on your candidature. Therefore they will do whatever is necessary – including testing you in ways you simply have not imagined – to ascertain that you are the right candidate for a seat in their college. The greater the competition at a particular institute, the tougher the PI, and the more the unexpected questions. The second factor that complicates the PI is you – the candidate. C: and why such education is best received from the institute whose PI round you are attending. If the answer to any of these 3 questions is less than logical or convincing, you are starting off in a pit you will not get out of. If you falter on any of these answers, you may still be selected if you are not the worst of the candidates and the number of seats available is greater than the number of applicants. While the former may be true in the case of most of us who have prepared dedicatedly for a year or so, the latter is never the case with any B-school worth its salt. 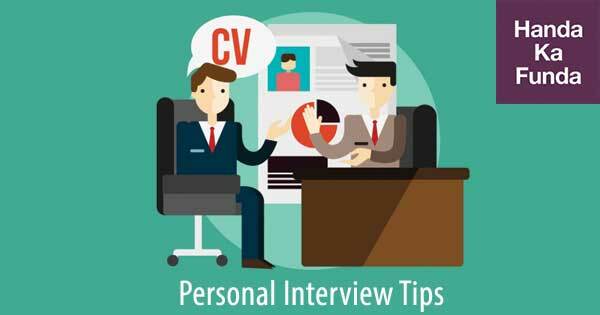 These three answers form the absolute minimum of your personal interview. Unless they are clear and logical, a favourable outcome of the PI is impossible. If these three answers are in place, and if the candidate demonstrates a positive attitude during the interview, the panel may even forgive the shortcomings exhibited in answers to other questions. Having understood this, we must begin our PI preparation with a crystal goal clarity. I recommend that you write these answers on paper, have them evaluated by your trainer/mentor, and revise them as many times as necessary in accordance with the feedback you receive. Answering these three questions is very different from answering some set exam questions, the responses to which you may mug up the night before and regurgitate the next morning. This is so because there are no ‘correct’ answers to any of these questions. There are only the answers that are either appropriate or inappropriate to your career goals, provided you have such a goal. There is no way you can ‘come up’ with these answers on the spot. They must be prepared beforehand. In addition to preparing for these questions, some further preparation is also necessary. B: the management of the institution and the faculty – you must know their names and qualifications, their area of expertise, their research work etc. We need this information to deal with some specific PI questions. C: The teaching methodology – is there anything different in the way they teach as compared to other B-schools? Find out. Also find out the student-to-faculty ratio. D: Internships – Find out what kind of internships are on offer. This is very important – perhaps more important than placements – because this is directly related to the application of your learning. Any placements you receive will always be conditional to your successful completion of the course and the internship. E: The Alumni – Find out who they are, where do they work. Contact them if you can. They are an important source of information on the institution and particularly the aspects of the institution which are not reported in media. Having researched on the institute, you must then focus on your academics (if you are a fresher) or work-experience related matters (if you are working or have worked in the past). If you are a fresher, the panel is going to test your knowledge of your subjects. Please ensure that you have revised the basics of all your subjects. Most panels usually tend to test the basics only, and if the answers are satisfactory, they will move on to other areas. However, the greater the competition, the more thorough the test of everything – including academics. The panels are interested in finding out if you are clear on your basics primarily because you are going to be students for the next two years, and they would like to know how keen you are. I have conducted countless interviews in my time, but I am yet to come across an Economics graduate (Economics is just one example – there are similar stories across the board) who can tell me the difference between the Keynesian multiplier and the Samuelson-Hansen multiplier. This is what I mean by basics. On the other hand, candidates with work-experience will primarily be questioned on the nature of their jobs. The questions will come from the following areas: the responsibilities, the reporting head, the team in which you work, the clients handled, the challenges faced – both usual and unusual, the facts about the company (such as market size, stock price, the management, the investors, the competition etc.). You may also be questioned on the areas of improvement for the company as you perceive them. Most importantly, you will be expected to give a good reason why you wish to leave the company and seek further formal education. And this answer better not be ‘more money’ or a cliché like ‘moving up the corporate ladder’. Freshers who have only recently started working may still be questioned on their academics, and they will also be expected to give a good reason why they joined the organisations that they intend to leave so quickly, even if it is for pursuing MBA. All candidates should expect to be questioned on the above two and prepare accordingly. When it comes to general awareness, most panels generally tend to ask you the questions which are somewhere related to your area of study or work. You will be expected to know the latest happenings in your fields. You generally will not be expected to know absolutely random facts, such as the capital of Venezuela, or the name of Queen Victoria’s chambermaid! However, a candidate whom I coached was asked in the IIM-A interview how many rivers he crossed while flying from his hometown to Ahmedabad. He was further asked to name them! Hence I say, the greater the competition, the more the unexpected. As for current affairs, everyone will be expected to know about the latest happening irrespective of their areas of study or work. These are the areas you must focus on when you study current affairs: the Union budget 0f 2017, the demonetisation of 2016, the proposed GST bill, the happenings in the E-payment industry, the developments in the telecom industry, the recent cases of judicial activism (national anthem made compulsory in cinema halls), the Jallikattu episode, and the Trump presidency and its latest developments. You may also want to look at Brexit, and the continental politics in general. Without being thoroughly prepared on all of the above, it is almost pointless to attend the PI at any good institution. While you are at it, find a quiet spot and ask yourself another question: why should that institute select me? This is a very important and difficult question, which will invariably come up in the PI. I feel there is a way to answer it, but I would like you to first answer it yourself without any advice. We will revisit this question in the future posts. Get yourself a professional folder (if you haven’t already) to carry your papers and certificates. Half the candidates I interact with carry their papers loose. This carries an immediate danger of losing important papers, and a not-so-distant danger of appearing unprofessional and clumsy in front of the panel. The dress code for interview is formal. I hate to impose restrictions on people, so this is what I say: you are free to wear whatever you wish to the interview. However, if it is something other than formal, there will be questions on it. If you think you can handle the questions and justify your choice, wear what you like; else, stick to formals. If you are attending the interview in an unfamiliar city, I recommend that you reach there a day before, if it is at all practically possible. Try to visit the venue the evening before. Find out the route, the transport connections, and the places where the traffic could be jammed, so that you can plan your journey properly the next day. The familiarity with the venue will put your mind at ease; you will be less stressed and more likely to do well in the interview. Spend on an extra night at the hotel – it is absolutely worth it. You could be looking at the opportunity of a lifetime.